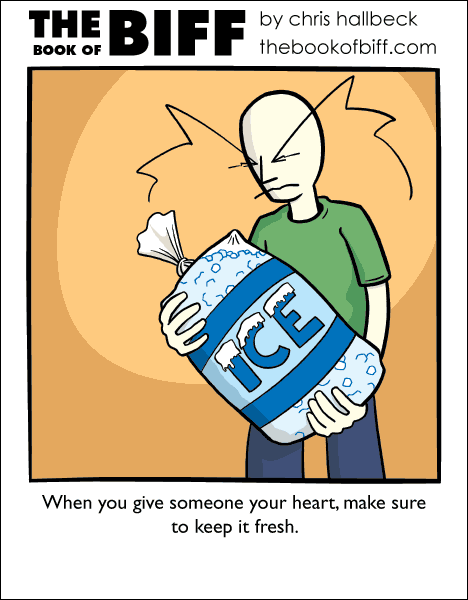 I remember as a kid I was really confused when we would go to the grocery store and see bags of ice for sale. Ice was always something “free” from my perspective. Don’t other people have freezers? If they can’t make ice where sre they going to put it? Wont it all melt in their car on the way home? Wait.. so you Don’t keep it in a jar of dirt? So Biff doesn’t even need a heart to stay alive?! Biff doesn’t really need very much to stay alive. They’re easy to transport if you get them before they grow three sizes in one day. biff keeps all his non-vital organs in little jars in the basement, just in case he needs them. as for his vital organs, well, he doesn’t have any, aside from his eyebrows. Great… Now I have that one annoying Christmas song stuck in my head. I’ve always hated that song. It’s Funny to look back through the old comics, Read this comic and the first thing that comes to mind is the Jar of dirt, and then notice the first comment is my own about a Jar of dirt. It’s helpful to realize my brain is functioning correctly.